This page describes how to use the Rectangular Custom Symbol. The Rectangular Custom Symbol element allows a user to create a customized rectangular circuit element to be placed onto their schematic. 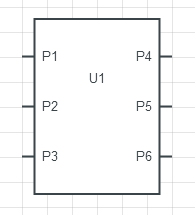 While the part is currently not backed by a simulatable device model, the user is able to specify the size of the element as well as the number and placement of the pins. To resize the rectangle, simply click on the resize arrow at the bottom-right of the element and drag to the desired dimensions. The number of pins able to be placed along the width and height of rectangle is shown just below the resize arrow when it is being dragged. To further customize the pin names and layout, double-click anywhere inside the rectangle to enter Edit Mode. You may also right-click and select 'Edit Parameters' from the context menu. To exit Edit Mode, double-click again or press the Esc key. To add a new pin, first enable Edit Mode. Click on any of the green plus signs to add a new pin at that location. Pins can only be added where there is a green plus sign. To add all possible pins, you may click the button in the adjacent parameter box marked 'Add All Pins'. To select pins for editing, click and drag anywhere within the rectangle while in Edit Mode and a red selection box will appear. To move one or multiple pins, first select the pins and then click and drag. Yellow 'drop zones' will appear that indicate where there is room to move to. Dragging the selected pins over a valid 'drop zone' will cause that zone to be highlighted in bright yellow. Release the mouse button to drop the pins into the new location. To specify a custom name for a pin, click once on the light gray box next to the pin. This will open a standard text input in which to type in the pin's name. To place an inverting bar over a pin name, such as VCC, prefix the pin name with an exclamation mark (!VCC). When done, press the Tab key to submit the pin name and advance to the next pin. The Custom Symbol's part, model and package name located in the middle of the rectangle can be edited in a similar fashion. To delete a pin, first select the pin by dragging a selection box over it, and then press the Backspace or Delete key. You may delete multiple pins this way as well. Below are some useful keyboard shortcuts for editing and manipulating Rectangular Custom Symbols. Please see Keyboard Shortcuts for a complete list.